Toronto, ON – On June 28st to June 29st at the Better Living Building at the EX and HUF Boxing Club, boxing is back by popular demand this year for the 2014 Scotiabank CHIN Picnic and it’s going to pack a punch! Just like previous years, the event will be sanctioned and hosted by Boxing Ontario and will feature many exciting boxing matches. Our Ontario boxers will be on display to show their great talent against some of the toughest boxers from Quebec and show why Ontario has the best boxers in Canada! This event is another stop on the road to the National Championships that are right around the corner! The Nationals lead to the much anticipated Pan Am Games next summer! 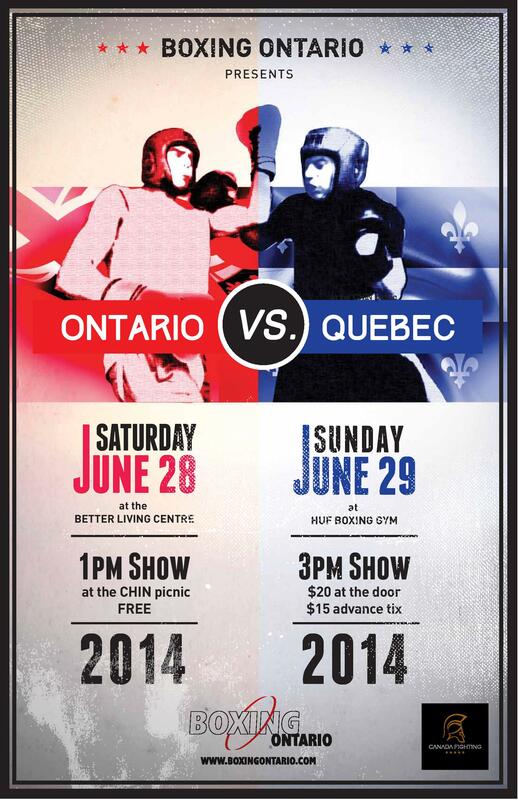 So come out and cheer on your Ontario boxers as they battle for provincial pride as the fight against some tough competition! Don’t forget to check us out at the event! Boxing Ontario will have an information booth with the latest news events and information needed to stay up to date with everything that is happening with Boxing Ontario! 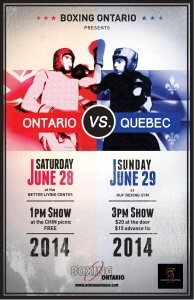 So come down and cheer on Team Ontario!